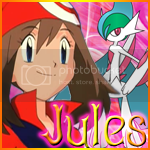 Pokemon Pets Game Official Forum » Media » Creative Arts Section » [Aladdin's Art Collection+Shop!] ~ An Art Never Rusts !! [Aladdin's Art Collection+Shop!] ~ An Art Never Rusts !! (2015-10-05, 01:40 PM)Magic.. Wrote: that nice!!!!!!!!!! Thank u bro. I am trying to work on art more but hard to find time hopefully soon. I will see what I can do soon. This is your Avatar, I hope you will like it and sorry for being late.